The long, dark evenings of the blackout made the streets extremely dangerous, and many people stayed at home. After lining the windows with black paper, or covering them with dark curtains, families settled down for (another) an evening in. The radio was an essential item in every home, as a vital means of receiving information about the latest progress on the front lines. Public messages were sent out in between music broadcast from the thriving dance halls in London's West End. The BBC also scheduled a large range of programmes, such as the comedy "It's That Man Again", from Liverpudlian comedian Tommy Handley. 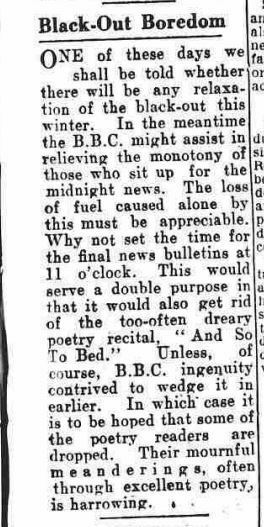 Some weren't so keen on the "dreary" poetry readings of the BBC's "And So to Bed", complaining that they were a downer for the people waiting up for the midnight news. People usually undertook their hobbies, such as reading or drawing, by candlelight. Indoor photography also became increasingly popular. The public were encouraged to make the most of the blackout hours, with women's magazines and newspapers publishing patterns and instructions on how to make and repair clothing. 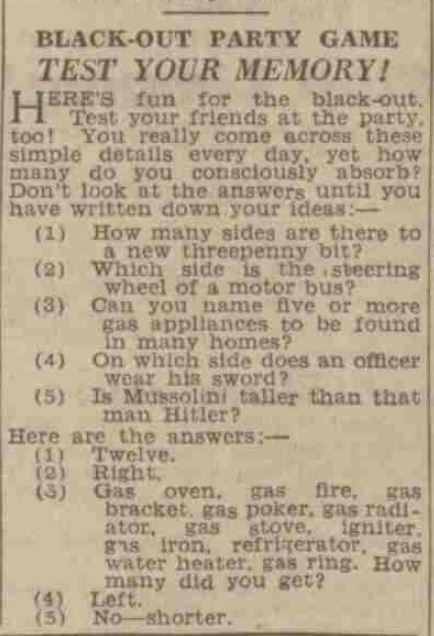 If the sirens started wailing, families had to pack up an evening's entertainment of newspapers and games and make their way to an air raid shelter. 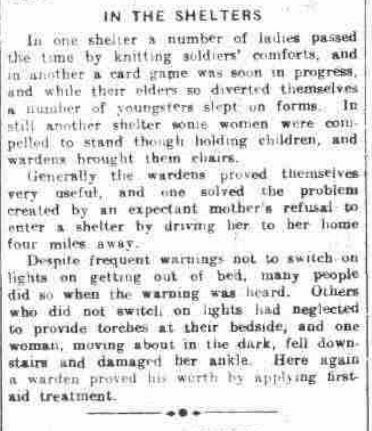 People who had gathered in the public shelters played games of Whist or knitted supplies for the troops together. The newspapers were filled with bumper puzzle pages and games to play during the blackout. Children read the newspaper comics while their parents caught up on the latest news or did the crossword. Whatever their entertainment of choice, families were encouraged to spend the blackout hours together to conserve power.